It seemed like a sure thing: an alliance between the auto industry’s most dynamic and respected salesman and one of the 20th century’s most visionary industrialists. It was a partnership that promised to transform America’s wartime production might into a new automotive colossus, but by the time the end came, less than 10 years later, it had become a cautionary tale of the perils of challenging Detroit on its own ground. This week, we present part one of our history of the Kaiser-Frazer Corporation, including the company’s foundation and the 1947-1950 Kaiser and Frazer cars. Whatever else one might say about the late industrialist Henry J. Kaiser, he could never have been accused of lacking confidence, drive, or ambition. Born in a farmhouse in upstate New York in 1882, he dropped out of school at the age of 13. By the end of his life, he had built what could without exaggeration be called an industrial empire, encompassing more than 100 different companies spanning the manufacturing, construction, steel, and aluminum industries. Early on, Kaiser worked as a salesman and later as a professional photographer, becoming a partner in a Lake Placid, New York, photography studio he subsequently bought out. A few years later, he resettled in Spokane, Washington, where he became a successful salesman for a paving company, and then moved across the Canadian border to Vancouver, British Columbia, where he founded a construction business in December 1914. He established a U.S. company in 1916. Kaiser did well throughout the twenties, but he hit the big time in 1927 with a $20 million contract to build roads in Cuba. In the thirties, his was part of a combine of companies that built large-scale public works projects, including the Grand Coulee and Hoover Dams. Kaiser was extremely successful, thanks to both his exceptional organizational abilities and his penchant for lateral thinking. Faced with a steel shortage, he started his own foundry and later established Kaiser Aluminum as an alternative source of material. Kaiser, always fond of corny aphorisms, loved to say that trouble was just opportunity in overalls and work boots. In 1939, Kaiser turned his attention to shipbuilding. He had never built a ship before, but by 1943, his companies employed more than 300,000 workers in seven shipyards across the U.S., sometimes even building the housing infrastructure necessary to support them. The Kaiser yards ultimately built 1,490 ships, representing more than a quarter of the Allies’ total merchant shipping tonnage. The ships were built with remarkable speed: In November 1942, Kaiser’s Richmond, California, yard completed a 14,245-ton Liberty ship, the SS Robert E. Peary, in only four and half days, less than half the time of the previous record-holder — another Kaiser shipyard. The press took to calling Kaiser a miracle worker, a description Kaiser himself modestly refuted. Still, he took an evident pride in his ability to do the seemingly impossible. 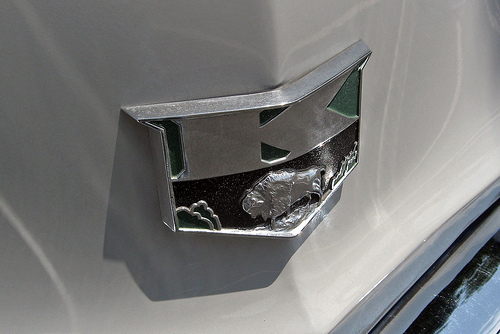 When Kaiser went into the automobile business, his advertising agency selected the buffalo as an emblem, calling it a symbol of the Western spirit. 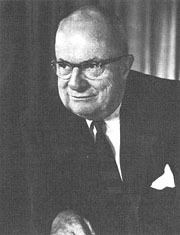 Joe Frazer, who became Kaiser’s automotive partner, later told author Richard Langworth that it was a perfect description of Henry Kaiser. As early as 1942, Henry Kaiser was thinking about cars. The U.S. government had halted civilian automobile production in February 1942, so many already-weary vehicles would have to soldier on “for the duration,” to use the popular expression. No one yet knew how long the conflict would last, but it didn’t take a lot of imagination to see that when peace returned, the demand for new cars would be ferocious. Aside from the obvious commercial possibilities, Kaiser was also very concerned about the need to create postwar employment lest the country slip back into economic depression. That had happened after the end of the first world war and some pundits envisioned a similarly grim post-WWII economy. In mid-1942, Kaiser organized an R&D staff in Emeryville, California, to explore a wide variety of different ideas, of which automobiles were among the more prosaic. Kaiser loved what we would now call “outside-the-box” thinkers — people unencumbered by conventional wisdom — but the eccentric characters the Emeryville operation attracted (both among the staff and the inventors and entrepreneurs who approached them with ideas) sometimes raised the eyebrows of Kaiser’s more conservative executives. Like many people in the thirties and early forties, Kaiser was fascinated by the idea of a compact, lightweight, inexpensive people’s car, a modern return to Ford’s pioneering Model T. In 1943, the Emeryville staff, which included engineer Jean Gregoire, formerly of Simca, began purchasing dozens of cars to study their designs. The R&D group also conceived some advanced automobiles of their own, many using plastic bodies and incorporating front-wheel drive, still a fairly radical idea in those days. Although many of these were blue-sky projects, Kaiser spoke publicly of offering a postwar compact for the improbably low price of $400. By war’s end, the R&D staff’s work culminated in a prototype called the K-85. It was not particularly compact by today’s standards — 197 inches (5,004 mm) long on a 117-inch (2,972mm) wheelbase — but it had many technical novelties, including “Packaged Power” front-wheel drive, unit construction, and “Torsionetic Suspension” with torsion bar springs and an unusual torsion beam rear axle. Tom McCahill of Mechanix Illustrated, who drove a prototype a few years later, lambasted the K-85’s heavy steering and noisy transmission, but thought that if the company could fix those problems, its chances were good. Despite such encouragement, Henry Kaiser understood that he still knew too little about the auto business. What he needed was a partner.